Understand profitability by specialties, HRGs (Healthcare Resource Groups) gender, and age. Identify patterns of cost and profitability by admission method and specialty. Provide interactive, web-based dashboards to staff so they can get exactly the data they need in real time. Quickly visualize and and easily analyze your data are the key to business value acquirement. Contact us to find out more how Tableau can help you to achieve success for your organization. Unified access to medical records and patient information Easy access to medical records and patient information could significantly improve the completeness and analysis of patient cohorts. Estimates indicate that more than 50% of patient information is maintained in unstructured data formats. This makes it difficult and costly to mine and leverage the data for improved care delivery, risk avoidance and cost efficiencies. 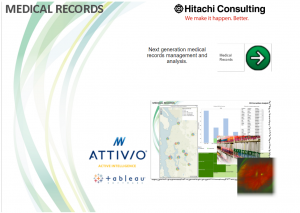 Developed by Tableau partners Hitachi Consulting and Attivio, this workbook demonstrates the power of visual data presentation and unified information access to patient electronic medical record data, text documents, and medical images for healthcare provider organizations. By visualizing the number of patients by location, ICD-9 code, and practitioner progress note, and offering the ability to drill down to detailed records of each individual patient, this workbook provides a comprehensive and interactive platform for health care providers at all levels to monitor, analyze and improve their services. Explore medicare spending at ease Medicare cost has been at the center of American political debate for decades. But how exactly are the billions of dollars spent every year—and where? 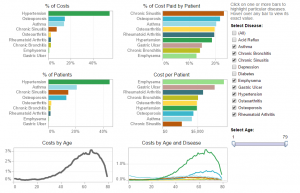 Here are some answers: Developed by Tableau partner, Slalom, these dashboards provide an overview on how Medicare dollars are being spent. As you can see from the map view, the majority of Medicare providers concentrate in Eastern regions. The average payment per patient varies widely; hover your cursor over any of the bubbles on the map to see provider details. The tables at right highlight the highest- and lowest-paid providers. For the entire data set, you will see that the highest-paid provider is UVA health Sciences Center in Virginia, which charges $50,553 per patient. 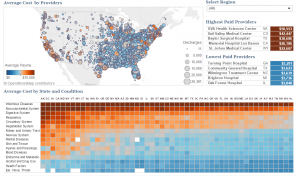 The lowest-compensated provider is Turning Point Hospital in Georgia, which only charges $3,291 per patient.The heat map at the bottom allows you to understand costs by medical condition and state. To more easily compare values, click on a condition name or a state abbreviation to isolate that row or column. States are sorted from left to right by average spending—Alaska, DC, Hawaii and California lead the pack in average Medicare spending while Arkansas, West Virginia and Alabama ring up the lowest average costs. Keep track of trends to minimize costs Healthcare providers and insurers need to know which diseases are the most prevalent in a given population, which ages are most affected, and what the associated costs are. Using anonymous patient-level costing data is extremely useful for this type of analysis. Using this dashboard, a healthcare insurer can evaluate the risks of particular applicants, which diseases they are most susceptible to, and what the costs of treatment for them would be. This application uses data from MEPS (Medical Expenditure Panel Survey). The insurer can select a number of diseases to consider using the filter on the right. They can filter age at the bottom right. The entire dashboard will update based on the filters. When published to Tableau Server, the dashboard provides a secure way for managers and executives to explore service trends right in a browser. Improve patient satisfaction by improving cycle time Wait time is one of the most important drivers of patient dissatisfaction. Track the time it takes to cycle a patient through from reception to discharge with all variables included. This allows you take the appropriate action to improve flows and improve patient experience. 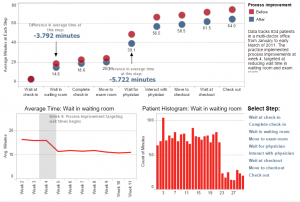 This visualization tracks about two months of data in a multi-physician office. On week 4, the office implemented a plan to improve processes, targeted at reducing wait times in the waiting room and exam room. The top view shows that after the process improvement, total cycle time did in fact decrease. Clicking through the steps of the patient cycle on the bottom right, you can see that the reduction in wait time was most dramatic at the two targeted steps. Other steps in the process stayed constant. The net result was that the process improvements reduced total cycle time from 73.7 minutes to 64 minutes, a reduction of around 13%.